The SRM Institute of Science and Technology (formerly known as SRM University) Main Campus (Kattankulathur) is 40 kms from Chennai city on NH 45, and around 20 kms from Chennai Airport. The nearest Bus stop and Railway station is Potheri. The University is well connected by road, rail and air. Those coming from other states of India by train, should get down at the Chennai Central Station, come out and cross the high road through the pedestrian subway and reach 'Park' suburban metro rail station. Two destination trains are available from Park suburban metro rail station - to (i) Tambaram (TBM) (ii) Chengalpattu (CGL). (i) If you take the train to Tambaram, then get down at Tambaram and reach the local bus stand there. Take T60 or T60 LSS bus and get down at SRM or Potheri stop. It is a 20 minute travel from Tambaram to reach SRM Institute of Science and Technology (formerly known as SRM University). (Total Travel time from Chennai Central Railway Station will be around One Hour). 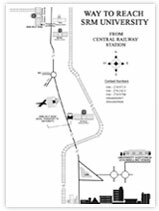 (ii) If you take the train to Chengalpattu, you can directly reach Potheri railway station. SRM Institute of Science and Technology (formerly known as SRM University) is just opposite to Potheri railway station. The nearest railway station from the Chennai Airport is Thrisulam, located just opposite the Airport. Get on a train towards Tambaram and follow the instructions given in the 'By Rail' section above for reaching SRM Institute of Science and Technology (formerly known as SRM University). Shuttle bus service is available from SRM Institute of Science and Technology (formerly known as SRM University) main gate to commute around the university. The University is situated in three different serene, green landscaped campuses. This main campus is at Kattankulathur in Kancheepuram District, a suburb of Chennai City on the G.S.T. Road (Chennai - Trichy National Highway, NH 45), 20 kms from Chennai Airport. Spreading over 27 acres, the campus at Ramapuram is within the Corporation of Chennai City Limits, adjacent to the Link Road that leads to the Chennai - Bangalore National Highway NH 4. It houses the College of Dentistry and a few disciplines of the Faculty of Engineering and Technology of the University. It also houses the Easwari Engineering College of the SRM Group, a multi-specialty hospital and a community health center. Spread across 25 acres in Modinagar, on the Delhi-Meerut Highway, NH 58, Ghaziabad, Delhi. This actually comprises of two campuses - one for Management courses and the other for Engineering and Technology courses. All campuses of SRM Institute of Science and Technology (formerly known as SRM University) are provided with facilities like post office, banks, playgrounds, cafes & restaurants, internet browsing centers, etc., - for comfortable learning and living.